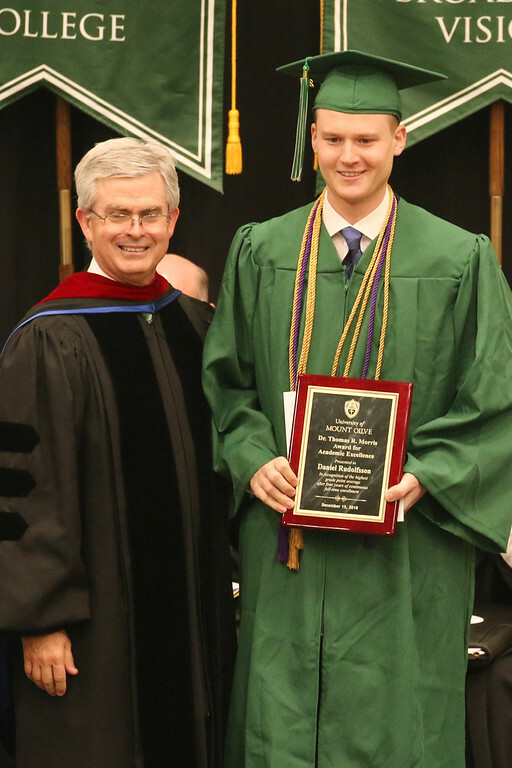 MOUNT OLIVE- Daniel Rudolfsson Gävle, Sweden received the distinguished Dr. Thomas R. Morris Award for Academic Excellence at the University of Mount Olive’s fall Commencement. The Award is presented to the UMO senior from the traditional academic program graduating with the highest Grade Point Average. The award is made possible through the generosity of Dr. Thomas R. Morris and includes a $3,000 check. Rudolfsson completed his degree in business management with a 3.97 GPA. In addition to his excellent academics, Rudolfsson was a member of the Trojan Golf team. Cwik noted that Rudolfsson volunteered often for extra reading and traveled twice monthly to North Carolina State University on Friday evenings to participate in an Economics Forum. “He represented UMO well,” Cwik added. Benefactor of the Morris Award is retired Goldsboro optometrist, Dr. Thomas R. Morris. A native of Nahunta in Wayne County, Dr. Morris was raised in the Union Grove OFWB Church. A graduate of UNC-Chapel Hill, he now resides in Wilmington.